Transvac’s mission statement is ‘to be the world’s leading supplier of innovative, ejector-based solutions’. This has proven to be less of a target, and more of a reality over recent years as their ejector solutions break new ground. Ejectors are pump/compression devices, with no moving parts. They are also sometimes known as Eductors, Surface Jet Pumps or Venturi’s. Based on Bernoulli’s theory, they utilise a nozzle to rapidly increase the velocity of a fluid (which can be a gas or liquid) thereby decreasing its pressure. Within the body of an ejector, the pressure drop across the nozzle creates a low-pressure region. This allows for a second fluid to be sucked in to the ejector (as it is drawn into the low pressure region) and quickly mixed with the high velocity motive fluid and then compressed up to a pressure which is somewhere between the ‘motive’ high pressure and the suction low pressure fluid. Ejectors offer obvious benefits over traditional mechanical rotating technologies; no moving parts, no maintenance, no emissions, no electrical power or fuel requirements and compact size, making Transvac’s ejector solutions extremely attractive. Introduction: Transvac entered the oil and gas industry nearly 20 years ago with their first application for Shell to boost production of a low pressure well in the Sean Field in the Southern North Sea. In recent years Transvac has worked in close partnership with Caltec Ltd to develop the potentially huge ‘Production Boosting’ ejector (Surface Jet Pump) market worldwide. The need to maximise recovery and extend the life of a field has become evermore important. With depleting reserves and traditional technologies operating at the limit of their capabilities, ejectors offer an exciting range of opportunities to ‘boost production’. Most commonly, shut-in or liquid loaded wells can be revived, as well as satellite or stranded wells deemed too expensive to recover with ‘traditional’ techniques. The key to these opportunities is in finding a suitable high-pressure fluid capable of driving (motivating) the ejector. In many cases the motive fluid used is energy normally wasted, thereby making the ejectors free to operate. It is common practice to ‘choke’ high-pressure (HP) gas wells so as not to back-out nearby lower pressure wells sharing the same manifold or downstream production facilities. Wasting usable energy across a choke valve in this way offers no added value to production. Transvac identifies this wasted energy as a valuable opportunity. “We can use the nozzle within the ejector to perform the role of the choke valve (by reducing the pressure of the motive fluid to meet downstream process requirements) but also to generate, for free, a suction flow into the ejector,” explains Peter Ainge, marketing manager. The suction created by the ejector is used to reduce the Flowing Well Head Pressure (FWHP) of single or multiple low-pressure wells to increase their production. The ejector then compresses the combined motive and suction flows to the desired export pressure. Transvac has also used this approach to boost production by reducing the pressure of a production Separator. “It’s simple really”, says Robert Hugill, technical sales engineer. “By reducing the back-pressure on production lines upstream of the Separator, they are able to flow more easily”. This technique therefore offers a significant increase in both oil and gas production. Also common, particularly in more mature developments, are Mechanical Compressor trains operating in constant recycle. “Production facilities are designed with particular throughput in mind. Over time, as production declines, mechanical compressors do not see the flows they were designed for. So Operators take some of the high pressure gas from the discharge side of the compressor, and feed it back into the suction side as a way of maintaining its operating envelope,” explains David Hoon. “It’s another example of available energy being wasted, energy we can use to drive our ejectors”, he explains. Transvac’s simple solution is to use thehigh pressure ‘recycle gas’ to motivate an ejector in order to increase recovery from low-pressure wells. The ejector then compresses the combined motive recycle gas and recovered low-pressure gas into the Compressor inlet, which not only increase overall production but enables to Compressor to operate more efficiently. This process can be used as an effective way to de-bottleneck a Compressor train and often eliminates the need to re-wheel Compressors. In some cases this technique can also be used to completelyreplace the first stage Compressor with an ejector, thereby saving maintenance and operating costs. Ejector (Surface Jet Pump) Solutions have also proven effective at clearing liquid slugs and reducing condensate levels, particularly in long flow-lines. “By reducing the pressure of the flow line, even by a few bar(g), increases the specific volume and thus the velocityof the suction gas. Unlike mechanical vompressors, ejectors can handle liquid slugs and condensate without damage. In 2006, Chevron used this technique on the Gemini field in the Gulf of Mexico to boost production by 24 per cent from stranded subsea wells, enabling recovery of over 2.5 billion standard cubic feet (bscf) of otherwise-lost gas. 50 km tie-back flow-lines were effectively cleared of condensate resulting in continued, increased steady production. The ‘Universal Design’ ejector, patented by Transvac, features a removable nozzle and diffuser section. Easily replaced,often within one shift, the new internals keep the ejector operating at its optimal design point and eliminate the need for a complete, new ejector, should process conditions change over time. The Universal Design also allows for installation of the ejector even before production conditions are known. When this information is then available, Transvac can offer fast-track manufacture and dispatch of the internal parts to have the ejector in operation in a shorter time-frame than the supply of a complete new ejector. Where data is available to map the decline of a well with some accuracy, a number of sets of internal parts can be shipped alongside the Universal ejector ‘Shell’ (the main body of the ejector) to ensure optimum performance over a number of years. Transvac supplied four sets of internals for a Universal Design ejector for NAM (Shell) for a platform in the Dutch Southern North Sea. Using free energy from an HP well, this ejector brought back to life two wells that were dead, due to liquid loading, and remained in operation for seven years until the LP wells finally ceased production. As the industry moves toward ‘subsea factories’, with more processing at the sea-bed, many traditional technologies are found wanting. However, Transvac’s ejector technology is already qualified and has been successfully deployed for subsea operation. “This is where ejectors come into their own”, says Short. “No moving parts, no power requirements, no maintenance...its a subsea engineer’s dream”. Transvac has been part of some of the Subsea industry’s most ground-breaking projects, such as for the Marlim, subsea separation and reinjection module, installed in the Campos Basin off the coast of Brazil for Petrobras and for Statoil’s Tordis Separation module. Transvac was able to offer witnessed full performance mapping of the Marlim subsea ejectors at their start-of-the-art R&D Facility in the UK. The Marlim project also included a number of Flow Restrictors and the development of a ‘four-nozzle’ ejectors design which has resulted in a new Transvac patent. Recent subsea development projects include performance mapping of ‘multi-phase’ ejectors to pump and compress fluids. “Multi-million dollar compressors using megawatts of power may be the answer for large fields, but ejector technology offers a low cost, proven solution for smaller fields. Stranded wells can be brought back in to production with relatively simple tie-backs using waste energy from existing infrastructures.” explains Peter Ainge. Traditionally in the oil and gas industry, waste and surplus gas has been disposed of by flaring to atmosphere. Today this process is becoming increasingly unacceptable as the industry progresses towards eliminating the emission of greenhouse gases into the atmosphere whilst simultaneously conserving energy. Transvac ejectors are ideally suited to this application because they employ high-pressure gas or liquid energy to entrain and compress waste and surplus gas. “As a result of a comprehensive test program in our R&D Facility, we can now offer gas compression up to 90:1,” says Short, R&D director. “Our new recovery system, ‘FlareJet’, is the result of many years of development and our very latest IP. This has opened up new opportunities for our clients who can now enjoy zero-flare operation at their facilities”. 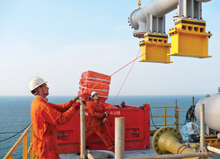 Ejectors have no moving parts are can be constructed from duplex, super duplex or 6MO thus making them an ideal choice for compressing sour flare gas.